This week we asked our MSY teachers about their go-to postures and advice for targeting the shoulders and the upper back. I enjoy a variation of child’s pose where instead of placing the arms on the mat or by your sides, you will instead cross the arms across your chest and relax over the arms. The goal is to feel a stretch right between the shoulder blades. Breath deeply to increase the stretch through the back of the body. Start in standing wide legged forward fold, feet about wrist width. Clasp hands behind you , exhale fold , relax the shoulder blades and neck letting gravity pull the hands to the mat. Keep the weight in the outside of the feet to stabilize the lower body. Hold for 5 breaths. Try a downward facing “kitchen dog.” True, that’s not an official pose from Yoga Journal, but it feels great. 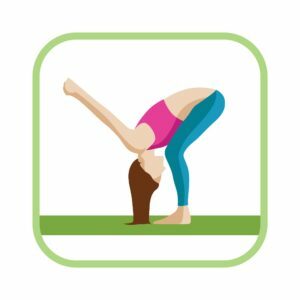 Grasp the lip of the kitchen sink, bow as you walk the legs back – just like a downward facing dog. Experiment by placing your feet a little closer to the sink so you can lean back and enjoy a wonderful stretch of the shoulders, hamstrings and back. Eagle arms are great for shoulders and upper back. Start sitting or standing comfortably. Spread arms wide at first then bend elbows tucking right elbow into left and bringing palms of hands or backs of hands together. No need to grip fingers. Leave them loose so no straining. Now move elbows together in circles and/or back and forth and/or up and down. Movement can be small and you’ll still feel stretch. If standing try forward fold with eagle arms. Amazing! Do other side to feel complete.